Get a special domestic rate for Indonesian residents! Ready for a more challenging course? 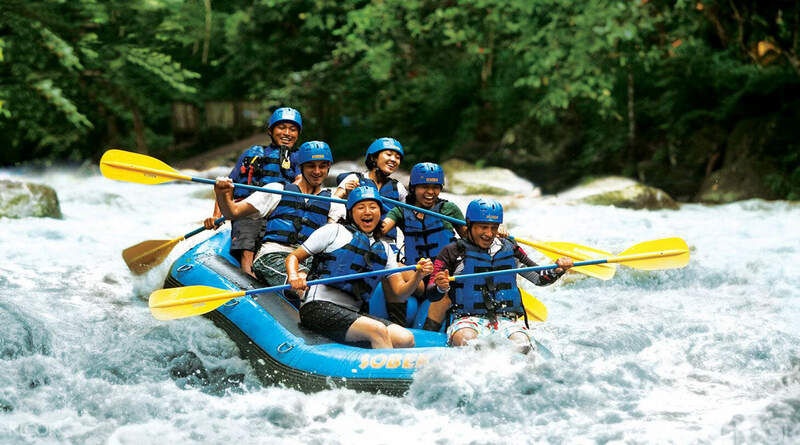 It's time to try Telaga Waja White Water Rafting! Exciting experience! Highly recommended for beginners for this 1.5 hours rifting. Pristine water, hidden waterfalls and tropical jungle surrounds make Bali's longest river a lovely location to tackle 33 rapids! 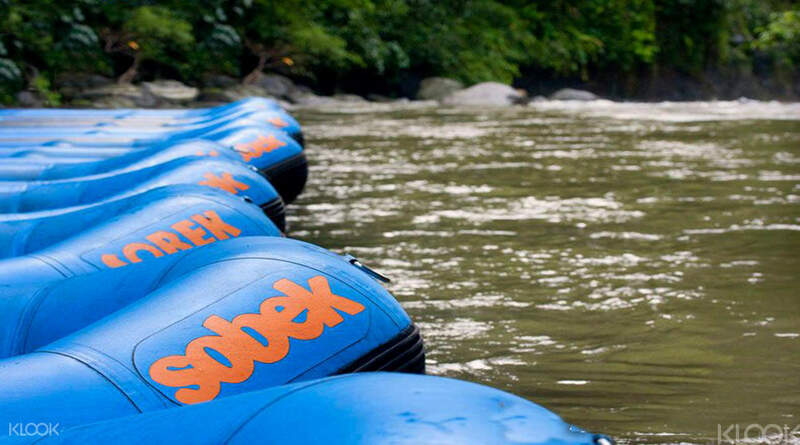 Bali Sobek are a firm favorite: renowned as the island's safest operator, they're a pioneer of white water rafting in Bali, and ambassadors for international standard equipment. Though perfect for beginners and families, don't expect the route to be too easy, for the Ayung is sure to give you a thrill! It's no surprise this is Bali's most popular river for year-round rafting. Not only does the river provide rafting accessible to all experience levels but it also showcases Bali's beautiful nature and interesting canyon wall carvings, not to mention that it's just 5km outside of Ubud. A fun experience in Bali!! The whole journey is thrilling and it’s really exciting to raft in the river! The coach is nice and helpful to guide us with a safe but exciting trip! A fun experience in Bali!! The whole journey is thrilling and it’s really exciting to raft in the river! The coach is nice and helpful to guide us with a safe but exciting trip! Highly recommended! Book with Klook and everything will be seamlessly taken cared off. Booked for 3 pax 1 day prior and a confirmation email was sent within few hours, stating pick up time at 1230hrs. Driver arrives exactly at 1230hrs and 1.5 hrs ride was a breeze. The orange color pick up transfer is easily identified & SOBEK is clearly displayed on the van. Upon arrival, driver took us to the Reception where 2 dry bags were provided (on loan). Bigger backpacks containing our clean cloths are placed inside a bigger dry bag. This big dry bag will be locked with a lockpad which will then be placed inside the car to be transferred to the venue where the rafting ends. Valuables (phone/money/key for big drybag’s lockpad) will then be placed inside a smaller dry bag that will be accompanying us on the ride down the river. Guide, Pak Pino attached rubber bands on my glasses to secure for the ride. The walk down the 509 steps to the river bank was bearable. The ride took 1hr 40mins. Very scenic and picturesque view along the way. Pak Pino is very knowledgeable and will explain to us things along the way. Be ready to alternately go fast and to stop paddling at times. It’s not a competition to complete the course soonest. Soak in the moment and enjoy the view. We paid IDR300,000 for all photos saved in a microSD taken of us by the designated photographer. Alternatively you can choose to purchase only a few photos at a lower price. Ginger tea prepared at the end of the ride is perfect to warm the body. The 200+ steps up to the shower facility is also bearable. Towel and plastic bag for wet cloths are prepared. The shower facility is beyond expectation - well maintained and traditional. The meal prepared was scrumptious for the price paid. My friends helped themselves with 2 rounds of chicken curry! I will definitely book this trip with Klook again in the future. Highly recommended! Book with Klook and everything will be seamlessly taken cared off. Booked for 3 pax 1 day prior and a confirmation email was sent within few hours, stating pick up time at 1230hrs. Driver arrives exactly at 1230hrs and 1.5 hrs ride was a breeze. The orange color pick up transfer is easily identified & SOBEK is clearly displayed on the van. Upon arrival, driver took us to the Reception where 2 dry bags were provided (on loan). Bigger backpacks containing our clean cloths are placed inside a bigger dry bag. This big dry bag will be locked with a lockpad which will then be placed inside the car to be transferred to the venue where the rafting ends. Valuables (phone/money/key for big drybag’s lockpad) will then be placed inside a smaller dry bag that will be accompanying us on the ride down the river. Guide, Pak Pino attached rubber bands on my glasses to secure for the ride. The walk down the 509 steps to the river bank was bearable. The ride took 1hr 40mins. Very scenic and picturesque view along the way. Pak Pino is very knowledgeable and will explain to us things along the way. Be ready to alternately go fast and to stop paddling at times. It’s not a competition to complete the course soonest. Soak in the moment and enjoy the view. We paid IDR300,000 for all photos saved in a microSD taken of us by the designated photographer. Alternatively you can choose to purchase only a few photos at a lower price. Ginger tea prepared at the end of the ride is perfect to warm the body. The 200+ steps up to the shower facility is also bearable. Towel and plastic bag for wet cloths are prepared. The shower facility is beyond expectation - well maintained and traditional. The meal prepared was scrumptious for the price paid. My friends helped themselves with 2 rounds of chicken curry! I will definitely book this trip with Klook again in the future. Nice guide! Awesome and very professional. We were all very well taken care of! Even the driver was good! The route of the white water rafting is very scenic too. Advised to go during more rainy season so that the water will be tougher so that you will have more adventurous ride! Nice guide! Awesome and very professional. We were all very well taken care of! Even the driver was good! The route of the white water rafting is very scenic too. Advised to go during more rainy season so that the water will be tougher so that you will have more adventurous ride! My friends and I had a good experience with Bali Sobek. The team will send an email upon booking with them and the driver arrived on time. 1hr plus journey from Seminyak. Whole rafting experience was pleasant, and guide was friendly. He walked behind us when going down and up the hill to ensure we are taken care of. As said, there is shower facilities and towel provided. Decent lunch too. Highly recommend. My friends and I had a good experience with Bali Sobek. The team will send an email upon booking with them and the driver arrived on time. 1hr plus journey from Seminyak. Whole rafting experience was pleasant, and guide was friendly. He walked behind us when going down and up the hill to ensure we are taken care of. As said, there is shower facilities and towel provided. Decent lunch too. Highly recommend. Great fun regardless of your level of experience. The operators go out of their way to look after you. Make sure you have some cash for refreshments half way though. They have a waterproof bag on the raft for keeping things dry. Great fun regardless of your level of experience. The operators go out of their way to look after you. Make sure you have some cash for refreshments half way though. They have a waterproof bag on the raft for keeping things dry. 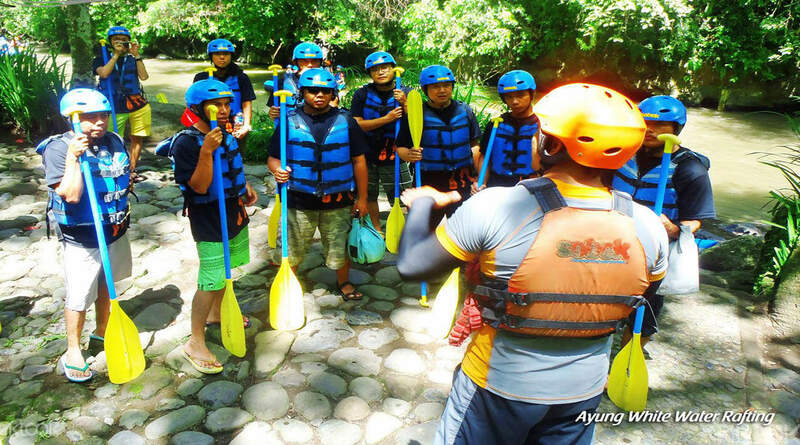 Ayung River Rafting is really worth the thrill and excitement! Thanks Bali Sobek for making us experience it! Very professional in terms of the assistance and very good facilities as they provide towels and plastics for our wet clothes. Also, we have not expected that kind of washroom and changing rooms but it was more than what we have anticipated. It was clean and has a big room for everyone! Even the driver was so nice and accommodating! Definitely recommending this to our friends! More power to you, Bali Sobek! Ayung River Rafting is really worth the thrill and excitement! Thanks Bali Sobek for making us experience it! Very professional in terms of the assistance and very good facilities as they provide towels and plastics for our wet clothes. Also, we have not expected that kind of washroom and changing rooms but it was more than what we have anticipated. It was clean and has a big room for everyone! Even the driver was so nice and accommodating! Definitely recommending this to our friends! More power to you, Bali Sobek! Very good coaching, they can even speak Cantonese and they are very nice. It is more a like to meet a friend than just merely being guided by a rafting coach. The ayung river is so beautiful and the package services are just so convenient. Good to have it every time you visit bali. Very good coaching, they can even speak Cantonese and they are very nice. It is more a like to meet a friend than just merely being guided by a rafting coach. The ayung river is so beautiful and the package services are just so convenient. Good to have it every time you visit bali. Raft is the most amazing experience. Prompt pick up and drop and very convenient as we had asked a drop at coffee plantation. The personal belongings that you take are very safe in their pad lock. food is ok and washrooms are comfortable. must visit this if you're in Bali. Raft is the most amazing experience. Prompt pick up and drop and very convenient as we had asked a drop at coffee plantation. The personal belongings that you take are very safe in their pad lock. food is ok and washrooms are comfortable. must visit this if you're in Bali.